Good morning! Are you a morning coffee drinker? How do you take it … black, cream and sugar? My hubby likes really strong coffee … Starbucks order is … brew of the day, no room for cream. He says that I like a little coffee added to my milk (please don’t forget the sweetener!). Hey, there’s nothing wrong with a skinny vanilla latte … is there? 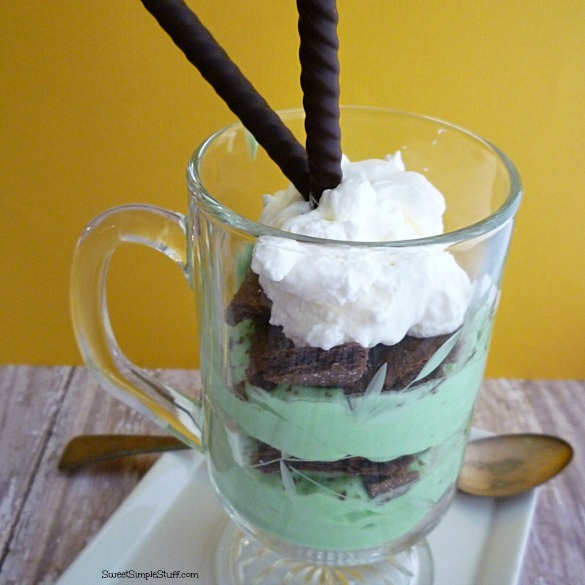 Today, I made a dessert for you … Irish Creme Parfaits for St. Patrick’s Day, in Irish coffee cups that normally don’t get used in my house. These cups sit in the cupboard, collecting dust (I washed them for this), just waiting to finally get used! The cups came from a Princess House party back in the 80’s … it seemed like somebody I knew was always having a Tupperware or Princess House party and I’d always buy something. We are not really a crystal and china kind of family … love the way it looks, but never use it. I try to practice … why have it, if you don’t use it, but am guilty of keeping stuff that doesn’t get used! Since the crystal sat in the cabinet collecting dust, several years ago, I gave away almost all of it to people who do use it … except these Irish Coffee Cups, because I knew that I would use them … just didn’t realize that it would be for dessert and not coffee! This pretty layered dessert is very similar to Eclair Cake and can be made for adults with Baileys or kiddie friendly without alcohol. If you don’t have Irish Coffee Cups sitting in your cabinet … use any clear glasses … Mason jars would be adorable! I used three graham cracker squares and about one half cup pudding mixture for each serving, creating six servings. You can adjust the recipe to make larger or smaller servings. Whip heavy cream with sugar until stiff peaks form and put back in the refrigerator. Make pudding mixture … In a medium mixing bowl, whisk pudding mix, Baileys, a few drops of green coloring and milk for 2 minutes. Fold in 1 cup of whipped cream or Cool Whip, save the remaining for garnish. Optional step … Put pudding mixture into a gallon size ziptop bag, zip it up and cut a corner for easy piping. Break 1 graham cracker square into small pieces and place in the bottom of each glass/cup. Pipe or carefully spoon a small amount (about 1/4 cup) of pudding mixture on top of crumbled graham crackers. Repeat steps 3 and 4, then step 3 for final layer. 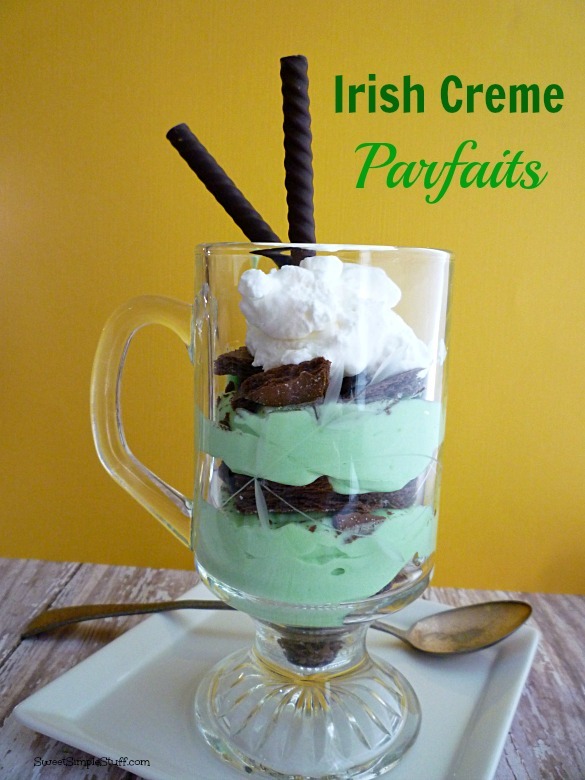 Remove from fridge, garnish with whipped cream and two Ovation Irish Creme sticks! * To make an alcohol free version – Increase milk to 1-3/4 cups and omit Baileys. Add some mint flavoring if desired! 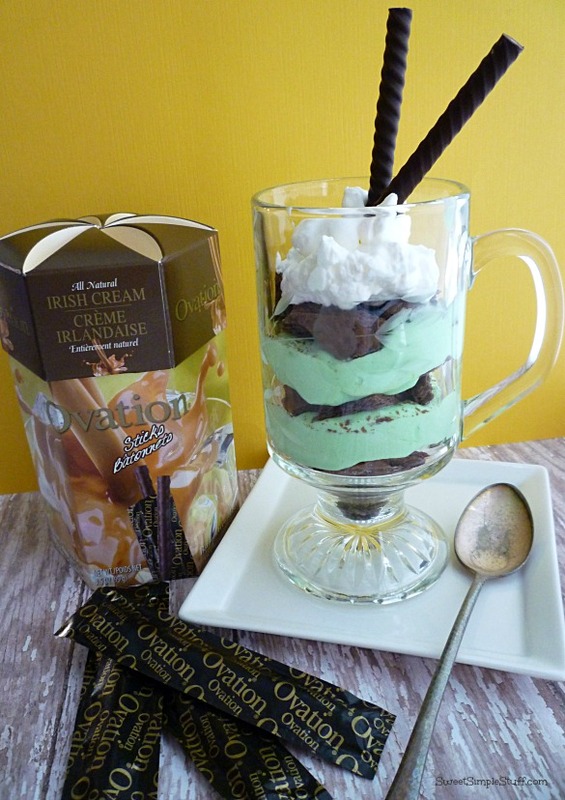 Looks pretty fancy … especially with the chocolate sticks! 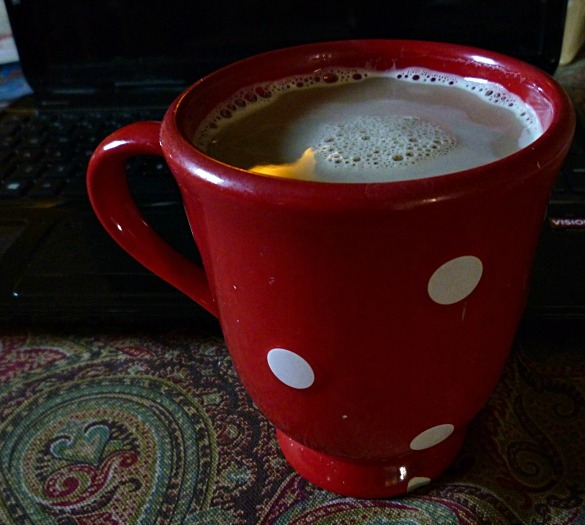 I use the same polka dot mug (it has a chip on the bottom) every morning with my version of a latte … named it the poorman’s latte, microwave 1/2 mug of 1% milk, add coffee and 1 packet of Stevia … easy peasy! I am drinking a cup as I am typing … my way to start the day! Thank you to SweetWorks for the Ovation Sticks! Do you start your day with coffee? I ♥ your comments! I have these same glass mugs. I use them all the time for my coffee, cream and sugar, but I never thought to use them like this. I am going to make these parfaits soon. thanks again for the wonderful ideas. Thank you Lucinda! Oh … you must have pretty coffee 😉 I’m going to make it a point to use my mugs more often! Coffee straight out of the pot for me; nothing added. Oh golly bum, I use my margarita glasses, large wine goblets, etc. for my desserts all the time. I don’t drink margaritas but wanted a couple glasses just to use as dessert dishes; layered jello desserts, brownie parfaits, etc. Shot glasses used for jello shot cocktails; ‘shooters’ :}. Think outside of the box and use those wonderful glasses, cups, mugs, etc. that you have. A person should make everyday a special occasion. Coming up in June will be our 45th anniversary and I try and make each and every day just alittle special. Still have candlelight dinners with desserts served in fancy glasses. No pizza on paper plates at my house. Enjoy your day and use your good dishes, glasses, etc. Thank you Colleen 🙂 I feel like such an underachiever, LOL 🙂 I do like to think outside the box … sometimes I just get stuck in a rut … coffee (with milk and sugar) will be in my Irish Coffee Mug tomorrow morning! Thank you Bobbi 🙂 I truly can’t tell the difference between regular and decaf!